What is the story you are living? The one that plays like a background narrative in your life? The one that fuels your choices and drives your focus? The one you tell yourself before you go to sleep, the one that you wake up with before you have energy to over think it? Are you trying and failing? Are you hurting and falling? Are you strong and fine? Are you doing good and being good, until your doing bad and being bad? Jesus came to change your story. Jesus radically altered the whole basis of “right living” before God. Instead of working every day to live right before him, you receive grace everyday to walk with him and trusting God to shape right living in you. It’s an on going conversation and intimate relationship. But sometimes you revert to your old story, the old dialogue, the old labels, old mode of operation. You begin to “do” more than “be” and work more than receive. Everyday is a new day to learn how to live different. Deep trusting is a different than incessant trying. Welcoming God to walk with you is different than working hard to walk with God. Receiving new mercies every morning is different than stagnantly reliving regulations to achieve right living. That’s it. You’re not “doing” anything; you’re simply calling out to God, trusting him to do it for you. That’s salvation. 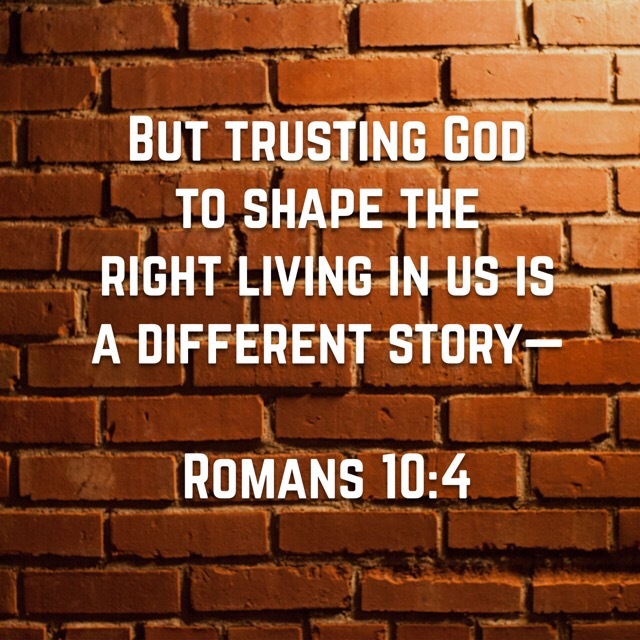 God has called you to live a different story than the one handed down to from your parents or the world. He has embraced you completely and holds nothing back from you. He is asking for relationship and trust, in the small things as well as the really big things. He is persistent in pursuing you and everyday is a new day to begin again.